Whether you're shopping for a bike or just admiring them, the first part you notice is probably the bicycle frame. The frame is the heart of a bicycle, as well as its art. Including the basically triangular core structure that supports both seat and handlebars and the extensions that attach to the wheels, the color and the geometry of the bicycle frame not only affects the beauty of the bike, but its strength and speed as well. The pleasure and success you derive from bicycle riding will be strongly impacted by having the right frame for your physique and your purposes. Naturally, your bicycle frame will take into dramatic account whether you ride primarily on roads or off-road. Not only are so-called mountain bike frames made of noticeably bigger "tubes," they are made of more shock resistant materials, with stronger weldings. Road bike frames have a smaller triangular geometry and the main consideration in their material is its weight. Everything on a road bike is designed to keep the rider's resistance to a minimum in order to promote fluency and speed, while a mountain bike is designed with the primary goal of shock absorption and maneuverability in mind alongside speed-influencing factors. Even among these two main divisions, you will find major differences in bicycle frames. Road bikes used primarily for touring or recreational riding will have frames with a more relaxed geometry and more total horizontal spread front to back, while racing bikes will tighten that structure for a shorter front to back bike length. A tighter triangle and less distance between the bicycle frame and the tires acts to decrease the resistance of wind and road for a racer, as well as to increase the bike's ability to respond to the quick, minute maneuverings road racing requires. There are several basic considerations to keep in mind when choosing the correct bicycle frame for your individual physique and your riding purposes. In addition, your unique body shape and weight will also affect what kind of bicycle frame is best for your comfort and accomplishment. 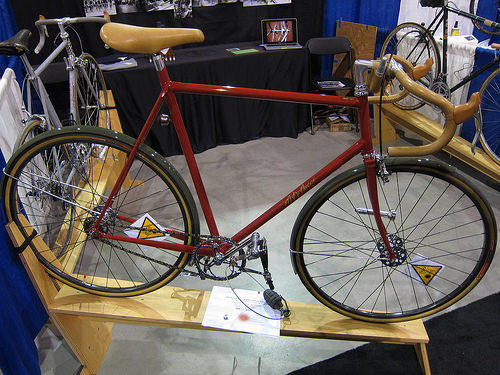 Standard frame measurements, made along the seat tube of a frame, take into account the length of your legs, but the relationship of your torso length and arm length to the length of your legs is also extremely important to comfort on a bicycle, and the length of the top tube of the bicycle frame must also be examined. Two riders of identical height may need completely different bicycle frames. The best thing you can do is to shop at a bicycle store where knowledgeable riders earn their living and where you are allowed to try out a bicycle before buying it.